Danny Wright thumps a header goalwards against AFC Fylde. Picture by Tom King. 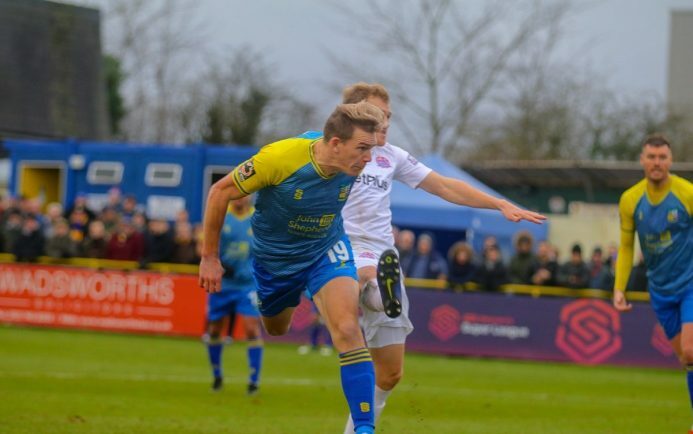 MANAGER Tim Flowers was upbeat about his Solihull Moors side despite defeat to AFC Fylde on Saturday, praising the overachievement of his team to this point. Moors went down 2-1 at the ATG Stadium after Daniel Rowe second-half goals came either side of Jamey Osborne’s equaliser in the 67th minute, but Flowers remained optimistic going forward. “We are allowed to get beat. We’re probably 19 places up the division than we thought we’d be,” he said. “We’ve punched massively above our weight as a football club in the last 18 months. A year ago we weren’t on anyone’s radar whatsoever. Now, all of a sudden, people are setting their stall out to come and try and deal with us. Nathan Blissett sent an acrobatic effort straight into Jay Lynch’s gloves, whilst Darren Carter’s narrow miss and Danny Wright’s low header also threatened to trouble AFC Fylde’s clean sheet. Osborne’s drive that pinged against the frame of the bar was the closest either side got to breaking the deadlock before half-time. The Coasters would emerge a bigger threat after the break and took a 52nd minute lead when Rowe met Zaine Francis-Angol’s cross and swept the ball home. Rowe would go close again when almost lobbing Ryan Boot from distance, before Osborne hit-back with a stunning hit that flew into the roof of the net. Moments later Rowe would hit the decisive winner, shifting the ball onto his favoured foot and hammering into the bottom corner to leave Boot without a prayer. Moors were unable to find a response but manager Flowers simply felt it wasn’t to be their day. “We created a lot of chances and couldn’t quite get the rub of the green. “I’m far from downbeat about it. I thought we pinned them in for long periods – especially second half. Flowers proceeded to point to the impact of the crowd and highlight the mentality of his side for the remainder of the season. “We’re humble and one of the smallest clubs in the division. It’s wonderful to see a good crowd here – I thought the spectators got right behind us today and made it a real good atmosphere. “Forget titles and all of that because it’s embarrassing really. We’re just scrapping away to finish as high as we possibly can. “We’ve got a very small squad of excellent lads punching way above their weight. Solihull turn their attention to the FA Trophy Third Round when they visit Hemel Hempstead on Saturday (3pm), with a place in the quarter-finals at stake.